It all began with a pencil and a little girl named Kaylie who lives in New Jersey. Kaylie asked her mother, Dinora, for a new pencil. From this simple question Kaylie’s Foundation was born. Its mission is to provide school supplies to underprivileged children in Latin American countries. With the hard work of Kaylie and her family, Sky Advertising’s support and the generous efforts of volunteers, Kaylie’s Foundation is changing the future for children all over Latin America. Asking for a pencil isn’t an unusual request but it struck a chord with Dinora. She grew up in Guatemala where basic school supplies are hard to come by. When Dinora was a child she would have to use a pencil down to a nub then give it back to her mother as proof that she needed a new one. Dinora told Kaylie some children in Guatemala don’t have access to basic school supplies which makes it much harder to learn. Over 2 million children in Guatemala don’t attend school and classrooms are considered substandard. When Kaylie heard this from her mother, she knew she had to help and began to gather school supplies from her friends to send to Guatemala. She recruited help from her mother, grandmother Eluvia and her uncle Giovanni. Giovanni Escot is Sky Advertising’s Senior Art Director. He’s been a member of Sky’s family for seventeen years. Giovanni grew up in Guatemala; he and his siblings know first-hand the struggle of not having basic school supplies. Giovanni has always maintained a strong connection to family and friends in Guatemala and has contributed in various ways over the years. Kaylie first began collecting school supplies in 2016. 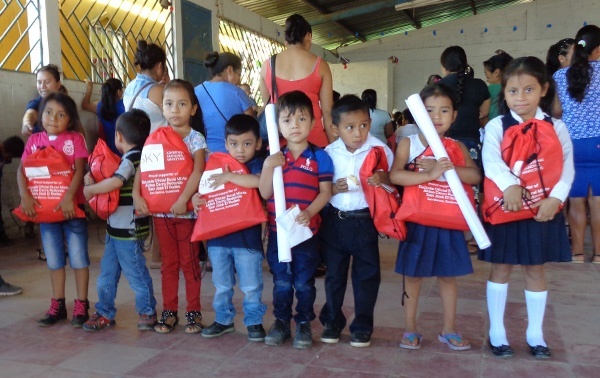 The supplies were sent to Guatemala to a small rural school four hours outside Guatemala City. In the beginning the foundation partnered with a specific school and was given a list of things the students need from grades one to six. But that wasn’t enough. Kaylie and her family wanted to make sure that the supplies got in the hands of all the children who needed them. In 2017, another drive was held to collect school supplies. This time Giovanni and Eluvia traveled to Guatemala to meet the children. 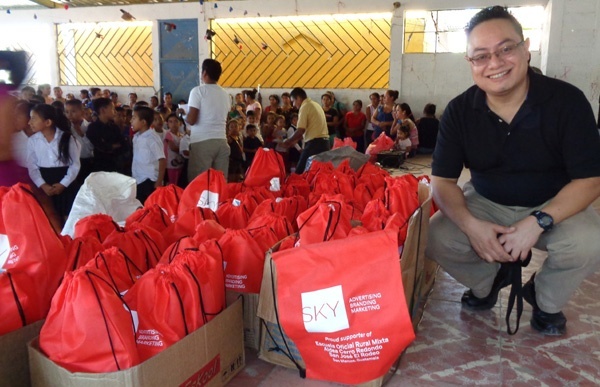 Sky supported Giovanni's efforts and provided bags so each child would have a school bag to hold their supplies. To a child in New Jersey a pencil might be a simple thing. But to a child in rural Guatemala, a pencil can mean the difference between going to school or not. These supplies take the burden off parents and allow these kids to have an education and the chance to improve their lives and the lives of their family. Kaylie’s Foundation is currently collecting school supplies, computers and accepting donations for another trip to Guatemala in January 2019. New initiatives are being developed, including a meal program and supplies and books for older children. You can also make a monetary donation directly to Kaylie's Foundation by clicking below.